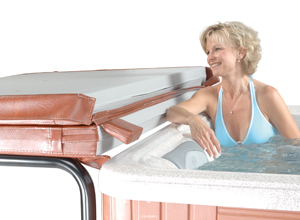 Our Spa Cover Shelf allows you to fold down your cover for a clear line-of-site during spa use. This quality product includes two swing-out arms that proved a "shelf" for your cover during spa use. Each arm is constructed of black powder-coated aluminum tubing to ensure years of trouble-free service. Installation is simple with the two non-corrosive plastic mounting brackets and hardware. Shelf tubes lengths are: 33-36" when installed and accomodate covers up to 8'.